Data loss happens every moment in today’s digital world. For iOS devices including iPhone, iPad and iPod, the first thing that comes to our mind when we suffer from data loss may be iTunes backup. While iTunes backup creates a copy of almost everything on our iOS devices, the detailed files in the backup are unreadable because the backup is a kind of SQLITEDB file. In order to retrieve the lost files, we have to restore the iDevice from iTunes backup file by erasing all newly added data. Is there a better way? Definitely there is. Now we can use iTunes Data Recovery tool to parse these unreadable iTunes backup files and allows us to recover data selectively without replacing newly added data on iPhone, iPad or iPod. 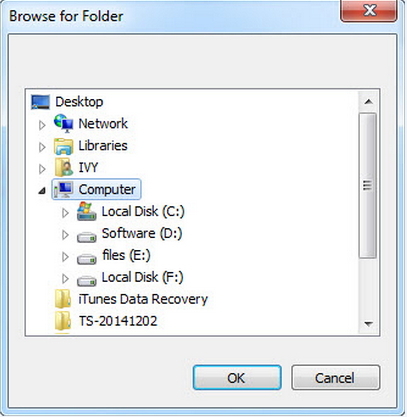 What Can iTunes Data Recovery Do? 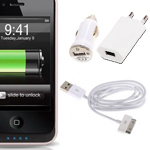 Recover iPhone, iPad, iPod Data lost due to accidental deletion, misoperation, or jailbreak failure. 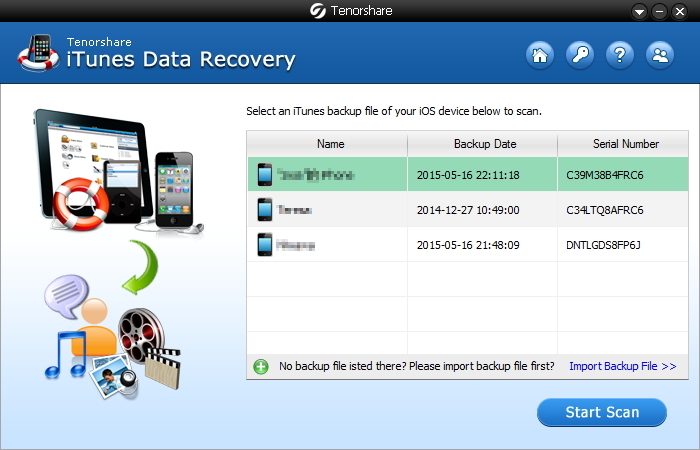 Retrieve data from iTunes Backup File when iOS device is lost, stolen or physically broken. Recover data from iTunes backup when iTunes can’t recognize your iOS device. 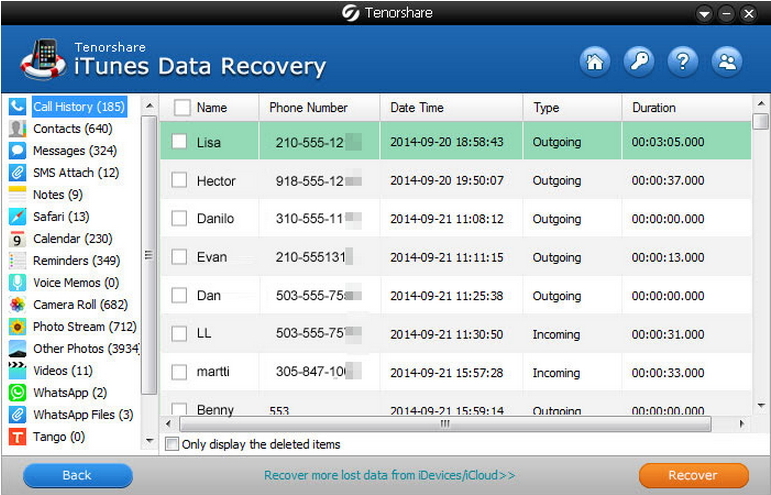 Restore data selectively and will not replace the current data in your device. Extract up to 13 types of files including Call History, Contacts, Messages (Attachments), Notes, Safari, Calendar, Reminders, Voice Memos, Photos (Camera Roll, Photo Stream, Other Photos), Videos, WhatsApp (Attachments), Tango and Viber. Preview what you have backed up in iTunes so that you can confirm whether this backup includes the lost data you need mostly. Support iTunes 12, iTunes 11 or earlier versions. Support backup file for iPhone 6/6 Plus/5s/5c/5/4s/4/3gs, iPad Air 2/ iPad Air/4/3/2, iPad mini 3/2/1 running iOS 8.3/8.2/8.1/8/7.1 and lower. iTunes Data Recovery are designed straightforward and user friendly. Start iTunes Data Recovery, it detects all iTunes backup you have ever synced and backed with iTunes. If you do not find the backup you need, it might be because you changed the location of iTunes backup. Click “Import Backup File” button to import iTunes backup file manually. Select the iTunes Backup File and click the Start Scan button to scan data. The Scan completes less than a minute. All Files in the backup are displayed according to file classification. Click one file type to preview data in original format and quality as you save in iOS device. Select Data you need and click Recover button to restore the data to local computer. Text data (messages, notes, etc) can be extracted to .xls, .txt, and .xml file, Contacts supports to save as .vcf file. Media data (videos, voice memos, etc) restores to original format and quality. iTunes Data Recovery is a professional and impressive iTunes backup retrieval tool. It extracts data from iTunes backup with no quality loss. iTunes sync and backup data up to date, which may cause old backups overwritten. It is a double insurance to back up data to local computer. Thanks for the amazing post, you could also just buy all of your lost apps with Feature Points.